Now I am sitting in my other favourite -this time above ground-coffeeshop in Istanbul. The Sark Kahvesi cafe in the middle of the loud and clamourous Grand Bazaar is in a sense similar to the Cistern cafe in that hundreds of tourists are buzzing about the general area (the Grand Bazaar being one of the most frenetic, chaotic markets on earth), but this little nook is itself fairly quiet. Just the quiet hum of (mostly Turkish) conversations over tiny cups of tea, and the click-clack of backgammon boards. Pictures of Sufi dervishes are painted on the ancient, vaulted, yellowed and peeling ceiling, and framed photos of Ataturk as well as black and white photos of the Bazaar a hundred years ago, line the walls. 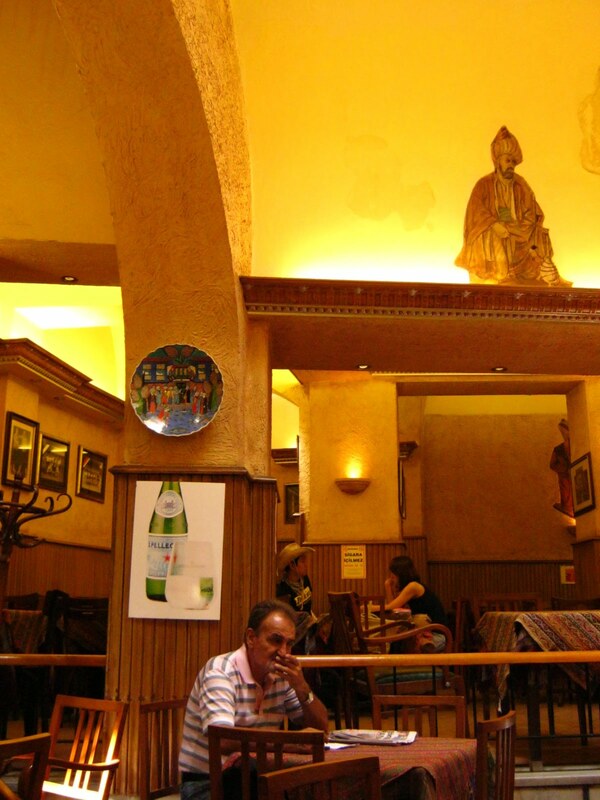 It reminds me a bit of the Al-Nawfara coffeeshop in old Damascus with its faded wooden trimmed walls and various hues of yellow and brown, although sadly there are no waterpipes to be found here, nor ashtrays on the tables. Nonetheless, it is a pleasant oasis of calm in the middle of a very busy place and I am enjoying my sugary tea here immesely as i write in this notebook and read my "Introduction to Sufism" book that is far more in depth with theory and difficult to read that I anticipated! My lazy afternoon consuming caffeine in these 2 wonderful cafes has left me feeling apprehensive about my return to Calgary. The reverse culture shock that is bound to set in having to sip lattes at sterile hipster hangouts like Phil and Sebastien, or expensive frappucinos at mall Starbucks. These Anatolian embroidered tableclothes will be replaced by wiped down plastic counters, these shaky wooden stools with sleek Ikea furniture.